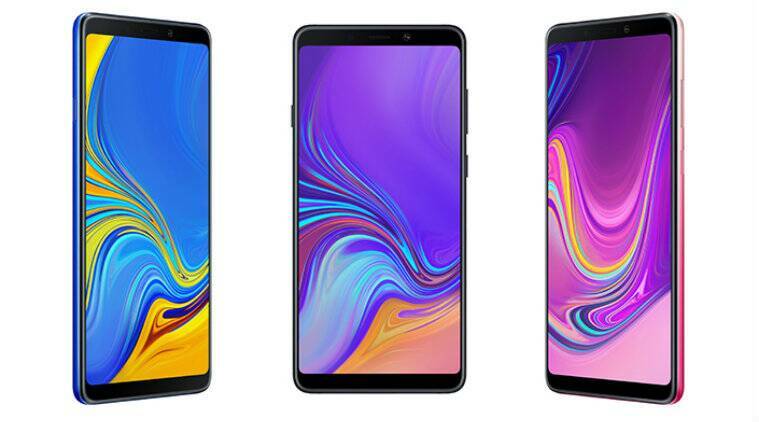 Samsung Galaxy A9 price in India, specifications, features launch Highlights: Samsung Galaxy A9 with quad cameras at the back has officially been launched. 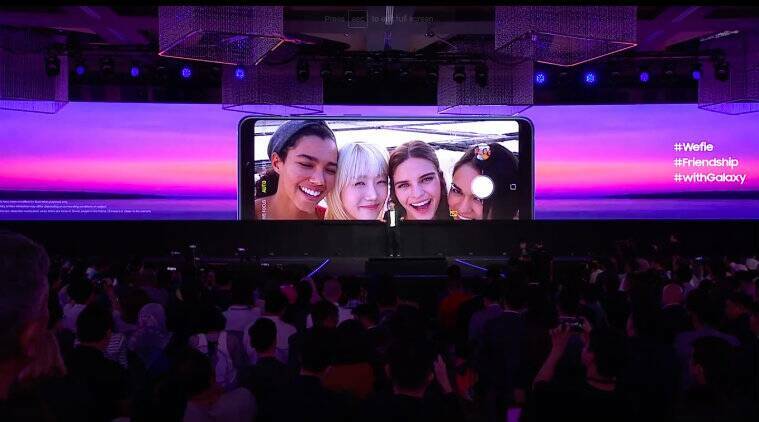 Galaxy A9 is the world’s first phone to sport four rear cameras. It was launched at the company’s “4X fun” Galaxy A event in Kuala Lumpur, Malaysia. 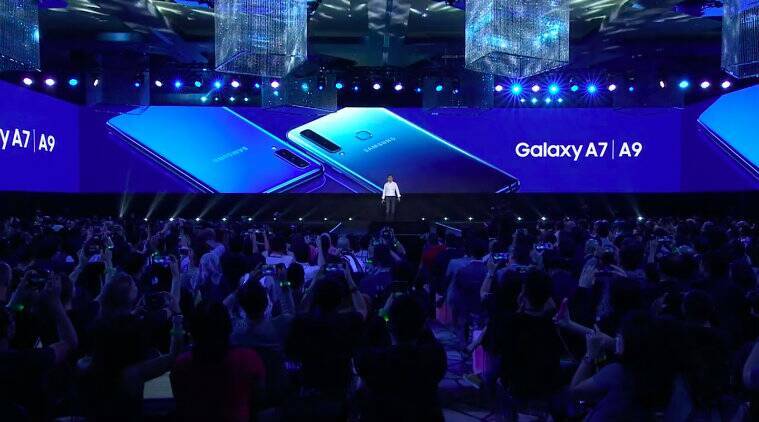 The Galaxy A9 launch event was also streamed live via Samsung’s official Newsroom site. The company also showcased its Galaxy A7 smartphone at the event. Samsung Galaxy A9 gets a 6.3-inch Infinity display. The four rear cameras include a 24MP primary sensor with pixel merging technology, a 120-degree ultra-wide camera sensor along with a 2x zoom telephoto lens and a depth camera lens. The selfie shooter is 24MP. The company says the cameras on Galaxy A9 are backed by Samsung’s own Artificial Intelligence (AI) camera software. The Galaxy A9 will start shipping globally in November. The Samsung Galaxy A9 will be made available in two RAM/internal storage variants - 6GB RAM/128GB internal storage and 8GB of RAM/128GB of internal storage. The storage is expandable up to 512GB via a microSD card. Samsung has stated that the 8GB RAM/128GB internal storage will be made available in select countries only. The device will be made available in November. Samsung Galaxy A9 comes with support for 4G, VoLTE, Wi-Fi 802.11 a/b/g/n/ac, Bluetooth v5.0 with speeds up to 2Mbps, NFC, GPS, BeiDou and GLONASS. Sensors include an accelerometer, fingerprint sensor, gyro sensor, geomagnetic sensor, hall sensor, proximity sensor and an RGB light sensor. Samsung Galaxy A9, the world's first quadruple camera smartphone unveiled at the 4X Fun Galaxy event in Malaysia. The phone features an elongated 6.3-inch Full HD+ Super AMOLED display with a resolution of 2220 x 1080 pixels. It flaunts a 3D glass curved back and comes in three colour options- Caviar Black, Lemonade Blue and Bubblegum Pink. Samsung CEO, DJ Koh announced that the Samsung Galaxy A7 is currently available globally for consumers to purchase. 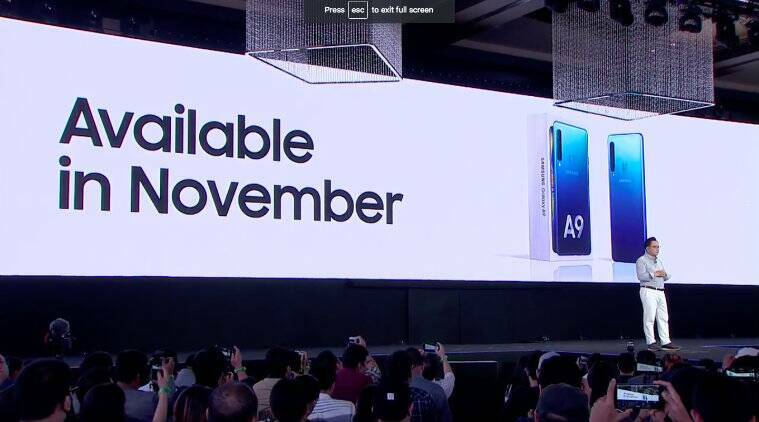 He also stated that the Galaxy A9 will start shipping globally in November. The Samsung Galaxy A9 sports a quad camera setup on the back consisting of a 24MP primary sensor with pixel merging technology for getting the best images in both day and night. The second lens is a 120-degree ultra-wide camera sensor paired with a 2x zoom telephoto lens and a separate depth camera lens. On the front, it features a 24MP front camera. All the cameras are backed by the company's own AI camera software, dubbed Intelligent camera feature. Samsung at an event in Kuala Lumpur has launched the world's smartphone with a quad camera setup on the back, dubbed Samsung Galaxy A9. The company also showcased its Galaxy A7 smartphone at the event. The Galaxy A9 comes with an infinity display, 128GB of internal storage expandable via a microSD card. Samsung Galaxy A9 launch: The first smartphone to sport a quad camera setup on the back? Samsung is going to commence the much-awaited Samsung Galaxy A9 Pro (2018) launch in a few minutes. According to an earlier report by AllAboutSamsung, the supposed Samsung Galaxy A9 Pro (2018) will sport a quad camera setup. The setup will include a primary 24MP sensor with OIS and an aperture of f/1.7, an 8MP 120-degree wide-angle sensor with an aperture of f/2.4, a 5MP depth sensor with an aperture of f/2.2, and a 10MP 2x optical zoom sensor with an aperture of f/2.4. On the front, the device will feature an 8MP sensor with an aperture of f/1.7 for taking selfies. Samsung Galaxy A9 features a 6.3-inch full HD+ AMOLED display with a resolution of 1080x2220 pixels. The phone is powered by an octa-core processor with 6GB/8GB RAM and 128GB storage, which is expandable up to 512GB via a microSD card slot. The phone is backed by a 3,800mAh battery. Samsung Galaxy A9 runs Android 8.0 Oreo. It measures 162.5 x 77 x 7.8 mm and weighs 183g. Sensors on the device include accelerometer, fingerprint sensor, gyro sensor, geomagnetic sensor, hall sensor, proximity sensor and RGB light sensor. It also supports Samsung Pay via NFC.